Enjoy & have a nice meal !!! : Once you Bake Bacon, you'll never go back to pan-frying it! Once you Bake Bacon, you'll never go back to pan-frying it! Arrange the bacon in a single layer. 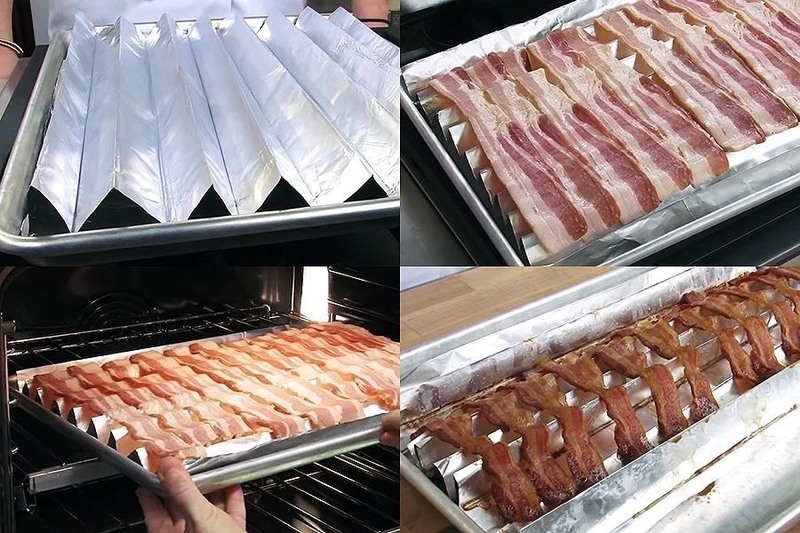 Place the tray of bacon in a cold oven. Turn on the oven to 400 degrees. Baking time will vary depending on how fast your oven gets up to temp, and how thick your bacon is. Thinner bacon will cook faster than thicker bacon. When the bacon is crispy, carefully remove the pan from the oven making sure not to spill the bacon grease. Transfer the bacon to a paper towel lined plate to drain. Then ejoy! If you want to save the bacon grease, pour it into a heat-safe container. *Note: If you have never baked bacon in your oven before, start checking the bacon as early as 8 minutes. The rate at which the bacon cooks varies depending on how fast your oven comes to temp. I’ve heard of bacon cooking as fast as 10 minutes and taking as long as 30 minutes. From my experience, it is usually done between 17-25 minutes.